Jess from Gracious Threads is hosting a virtual baby shower while she enjoys some baby snuggles with her newborn. I am happy to share a fun (free!) excerpt from the Paneled Sunsuit pattern. 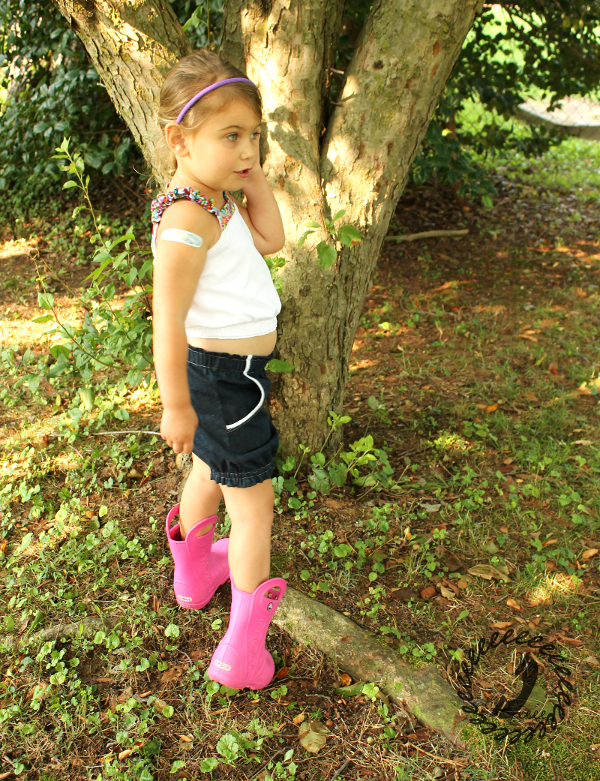 Just like the rest of the Paneled Sunsuit pattern, the Tank comes in sizes newborn to 12 years. The bodice is meant to be fitted, but not tight. 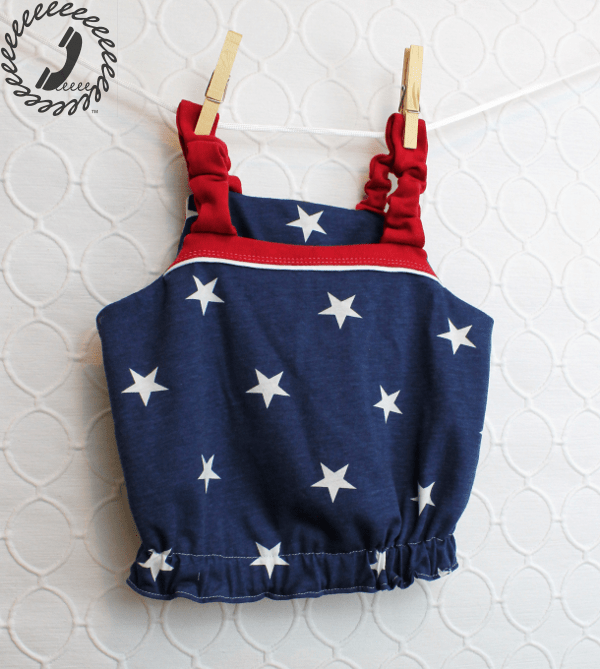 There is an elastic channel in the back of the tank to prevent gaping and yet still allow the bodice to go up and over the hips when sewn to the bottoms in one of the combination views (sunsuit, jumpsuit, maxi dress, and jumper). I love how it adds an extra ruffle element to the back while the front maintains it’s clean lined simplicity. The straps have elastic inside so they can stretch (again over the hips when sewn in a combo), but also as a design element to create the bit of ruffling at the shoulders. The tank is a bit cropped as the combination views are meant to be highwaisted, which is super adorable. The one Bean is wearing is a size 4t and she has just moved up to the 5 size so it’s a bit shorter than if you choose your correct size in the chart. Of course, Bean keeps pulling the waist down over her belly which I find hilarious. The pattern includes instructions to make the elastic waist tank version AND a simple hemmed version without the rouching of the elastic at the waist, but I adore the elastic version. 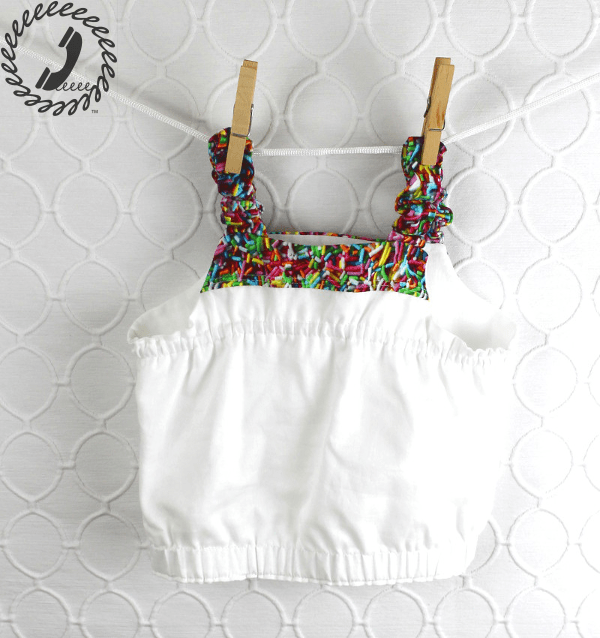 As with the rest of the Paneled Sunsuit views that use the bodice, the tops (panels) and straps are a great spot for scrap busting or using a cool notion you’ve been saving. The tank can be made in either woven or knit fabric. This knit one I made for the 4th of July celebrations this weekend is sure to be a hit. 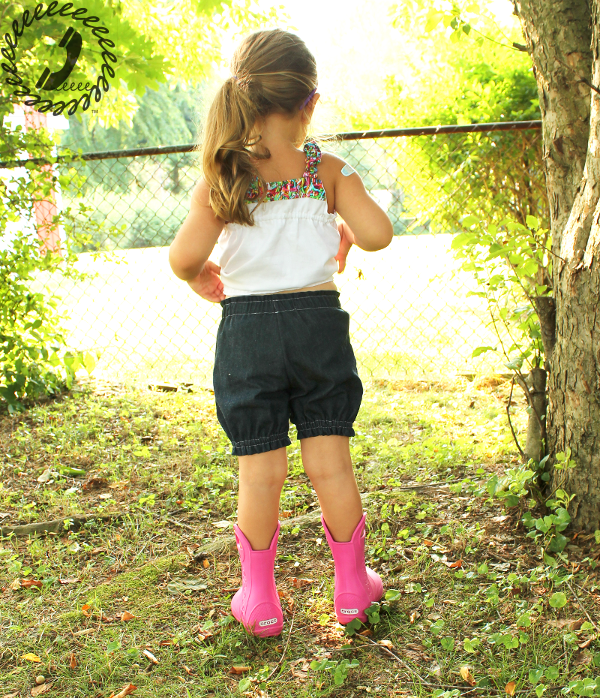 I’ll be posting about each of the ten views of the Paneled Sunsuit over the next few days so stay tuned! In the meantime, you can pick up the pattern here on UpCraft Club. So….. which view do you think you’ll make first?